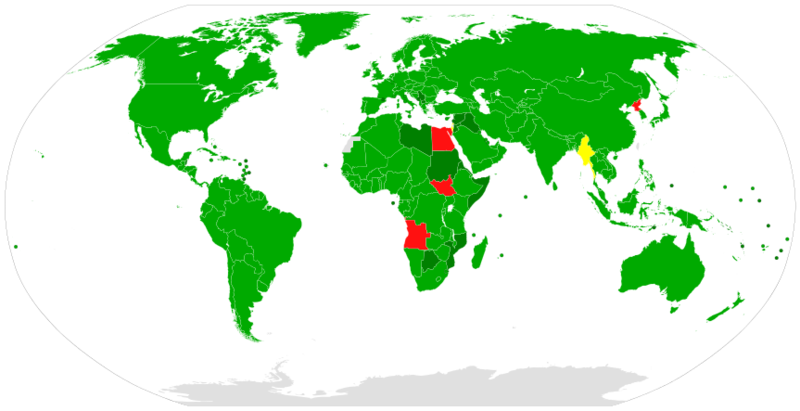 Participants in the Chemical Weapons Convention. In red: non-signatory. Source: Wikimedia commons. On 4 February 2015, the Organization for the Prohibition of Chemical Weapons (OPCW), which was created in 1997, condemned the use of chlorine as a weapon in three villages in northern Syria (in Talmenes, Al Tamanah, and Kafr Zita) from April to August 2014. The use of chemical weapons is a breach of international law. The Executive Council of the OPWC did not attribute responsibility to the Syrian government for the alleged use of chlorine, but it expressed its ‘strong conviction that those individuals responsible for the use ofchemical weapons should be held accountable’. This is a crime which could lead to an investigation by the International Criminal Court. Iran was the only state which refused to condemn the use of chlorine, despite being a member of OPCW. Argentina, Brazil, Chile, Guatemala, Mexico, Panama, Peru and Uruguay (Latin America and the Caribbean). Finland, France, Germany, Greece, Italy, Netherlands, New Zealand, Spain, United Kingdom and the United States (Western European and other states).